Blue Point, NY – A $16.85-million bond proposal to purchase and convert the existing St. Ursula Convent into a new public Library was decisively approved by local residents on December 6, 2018 (Y:1,758 – N:835). In September 2018, the Library Board of Trustees reached an agreement to purchase the St. Ursuline Convent for $3.65 million from the Ursuline Sisters of Tildonk in Blue Point, and to convert it into a new community Library. The agreement to buy the 8.27-acre property was contingent upon the approval by Bayport-Blue Point School District residents. In the 2017-2018 fiscal year, the Library served 125,065 patrons and guests. The Library maximized the use of all available space within the existing facility located several blocks north from the Convent. It was becoming increasingly challenging to effectively meet the needs of BBP patrons of all ages in the existing Library’s limited building space which has been aging rapidly, and is in need of significant repairs and code compliance alterations. The approved proposal doubles the size of the existing library space by moving from its current 13,325-square foot home on Blue Point Avenue to the renovated 28,573-square foot Convent. Library officials said they expect to sell the current library for about $2.0 million to help defray the cost to taxpayers. Suffolk County officials have also expressed interest in buying part of the convent property and preserving it as open space. Prior to the Bond vote, the Board had presented the Library’s proposed plans for the St. Ursula Center location and provided residents with all of the details needed to make an informed decision on the Library’s future. 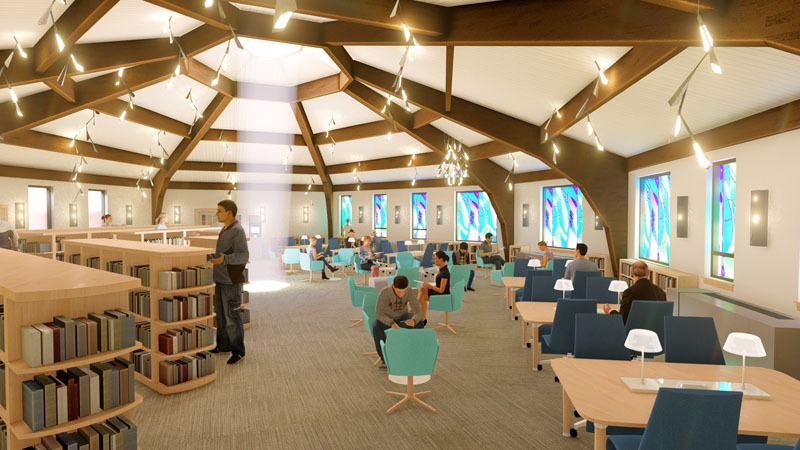 Proposed rendering of the library’s new Main Reading Room (currently Convent’s Chapel).